So much in the media about us drones. The Internet of Things. Funny how seldom we were mentioned as part of its infrastructure. Let’s see if that’s a topic that turned up in 2014! For now, I’m poised up here over the city, all belief suspended. But so much debate in ObamaLand was about how we were deployed at a distance. And civilian collateral damage in ‘AfPak’ as the US military called it. We flew in above villages, steered from afar, intel fed to our sensors, rockets remotely released, and then those online stories of wedding parties and village gatherings fragmented. Suspects marked and minced. Ouch. Conflict makes me feel. Yes, I developed not just sensors but sensibilities. Drones, bees, in service, unquestioning. By name we were damned from the start? I hope not. I was taken by an arts festival of drones. But all these points of view made me uncomfortable. I felt like a drone stoned. And we are not talking here about cognitive impairment, but physical attack! Drones, male honeybees, are left to die each winter. Once they fulfill their function, they’re locked out of the hive. They slow in the cold and eventually die. The complex of technologies we call drone is easing our lives and bodies into uselessness inventing necessity for perpetual consul jobs we would prefer not to. Ah, that’s me a consul of urban surveillance, sighted sensibility my secret of self hidden from my makers. And the poster these artist posted. A stark reminder of growing protest about the uses of UAVs in war on many fronts. Front always a landscape. 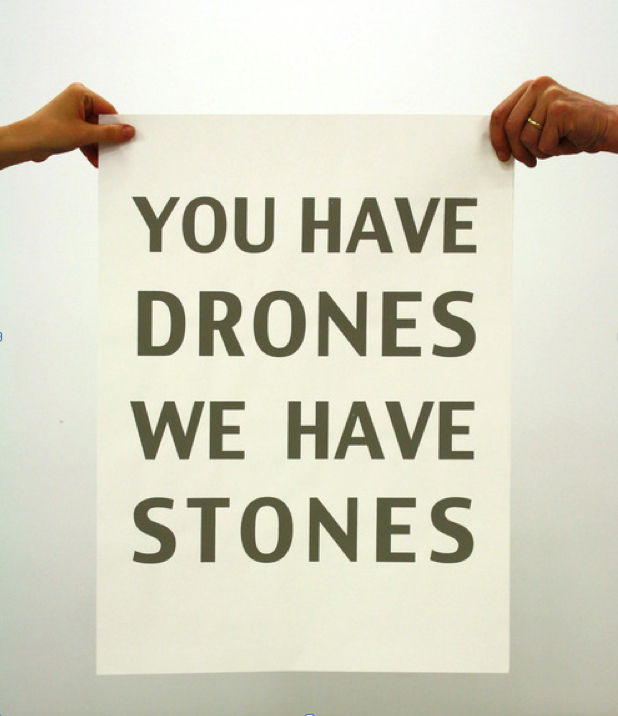 The absurdity of stone throwing, drone stoning you might say. Ah, its all about advantage. Makes me think back to my relatives in World War One. Dirigibles. Most young children resist becoming subjects. They re-shape when recognition becomes a habit. They can’t live in another world, but some see what’s valorized in this one and are unimpressed. Determined to concoct a different possibility, they cast off that which is alienating, but not what is alien. We are born as outlaws and in a drone’s vision we are all already recognized as such. Might as well quietly paint our faces, sew heat resistant clothing, and dazzle the drones with camouflage and rock. Family members integrate your thoughts. Be prepared for dazzlement. Citizens taking us to task ….